The Maharani of Jaipur, last link with Indian’s Polo golden age. In mid-2010 the Hurlingham Polo Association held a thanksgiving service at St Michael and All Angels Church, Sunninghill, in memory of Gayatri Devi, (1919-2009), better known as Ayesha, following her death in July last year. Through her husband Man Singh, Maharaja of Jaipur (1912-70) but known simply as “Jai,” she was the last surviving link with the golden age of Indian polo. Given that the top end of polo is now light years removed from its origins, the point should be made that the cradle of the modern game was India. For centuries the great empires of central and east Asia polo had played it both as a court pleasure and to train cavalry for mounted warfare, but those empires were long gone. Only in the foothills of the Himalayas did the game continue, a no-holds-barred version contested en masse between rival hill-tribes. In the 1850s British army officers and tea-planters in Assam Province took up hill-tribe polo and brought it to Calcutta. From there it was embraced all over India by police, army and Indian Civil Service officers, by British merchants and by the noble families of the Indian principalities, officially sovereign states but in practice under British protection, accounting for one-third of the landmass of the sub-continent (including what became Pakistan and Bangladesh) and one quarter of the population. British cavalry officers serving in India drafted the rules of modern polo. By the end of the 19th century India boasted 175 polo clubs. Central to polo’s golden age was Rajputana, an area of 340,000 square miles in northwest India, now called Rajastan, ruled by princes who prized above all the warrior virtues, symbolized by combative sports and horsemanship. To be a member of a ruling family of one of the larger a larger princely states as were Ayesha and Jai, was to receive as one’s birthright the best that money could buy, bestowed with pomp and pageantry by staff and servants numbered in hundreds; in sum, a world evoking fairy tales from ancient times, far removed from the first half of the 20th century. In 1931 the former ruler of Jaipur died. Without a male heir, he had chosen a distant kinsman, Jai, to succeed him. To reinforce Jaipur dynasty’s ties with the neighboring Rajput state, of Jodhpur, the ten-year old Jai was betrothed to two Jodhpur princesses, one the aunt of the other and both older than Jai. Jai lived all his life at full throttle, his energy focused variously on soldiering-in World War 1, he served as an officer of the British regiment in North Africa; as a progressive leader of Jaipur, a country the size of Switzerland; and in the pursuit of pleasure, from parties to polo, a consuming passion to the end. Fortuitously for Jai his polo career overlapped with that of Rao Raja Hanut Singh (1900-82), perhaps India’s greatest-ever player; certainly its ablest strategist and talent-spotter, both of ponies and players, in India in the interwar years, and in postwar England for some twenty years. From 1921-31 Hanut led the Jodhpur team to victory in Indian championship trophy, and from 1932-39 he won the same trophy for Jaipur, with Jai playing No.4 and Hanut No.3 (both nine-goalers at their peak), together with Hanut’s half-brother Abhey Singh and the Crown Prince of another Rajput state, Prithi Singh, both eight-goalers at their peak. In her memoir, A Princess Remembers, co-authored with Santha Rama Rau, Ayeshe recalled her childhood self as a spirited tomboy, uninhibited by the status of her father, who ruled Cooch Behar or her maternal grandfather who ruled the principality of Baroda. In 1931, aged 12, she shot her first panther. That same year when Jai joined her family for Christmas in Calcutta, by Ayesha’s own account she became infatuated. Her feelings were reciprocated in a clandestine courtship which continued for six years. Though Ayesha’s family admired Jai, they opposed the possibility of her marrying him. Ayesha’s mother, a famous beauty and socialite, drew the line at her daughter joining a harem or living in purdah in a Jaipur palace with a retinue to ladies-in-waiting, companion to two senior wives by the same husband, while her older brother, heir principality Cooch Behar principality, warned her of Jai’s reputation as a ladies’ man. Ayesha was immovable until her family gave way. Following her wedding to Jai in May 1940 she turned 21 on their honeymoon. For Jai, it was his first marriage inspired by love rather than dynastic considerations. All the evidence suggests thereafter that he kept his roving eye in check. As much at home in England or Switzerland where she had completed her education as in India, Ayesha never adopted purdah or took up permanent residence in the Jaipur palace, but she developed cordial relations with her senior co-wives and supported their children. Ayesha relished the freedom World War 11 gave her as an army captain’s wife from the formality of palace protocol. 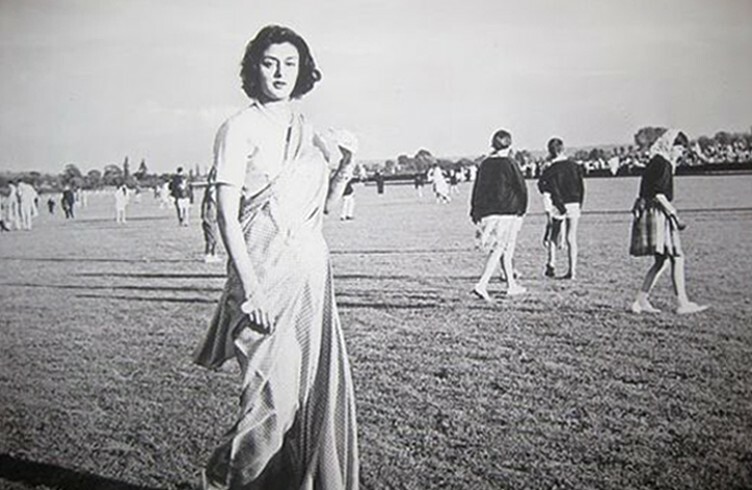 Then and ever after she accompanied Jai wherever he went, from England each summer for its parties and polo to his posting to Madrid in the mid-1960s as Indian ambassador. Among the many guests they entertained at their Jaipur palace were Eleanor Roosevelt, Nikita Khrushchev and Jackie Kennedy, Queen Elizabeth and the Duke of Edinburgh. Drawing on her training in London in book-keeping, Ayesha reined in waste and abuse in management of palace expenses, and founded a school, to this day much in demand, offering progressive education to daughters of titled families, whose schooling was traditionally confined to domestic and marital duties, to prepare them for the wider world. Following India’s accession from British rule to sovereignty in 1947, by virtue of her position as Maharani of Jaipur, Ayesha found herself propelled into national politics. Both the ruling Congress Party and Swatantra [independent] Party courted her to stand for the Jaipur electorate. Dismayed at the government’s incompetence, abuse of power and hostility to the princes (who had ceded their principalities to the new state, but retained their titles and other privileges), in 1962 she stood for the Swatantra Party, winning the Jaipur seat in the national parliament by 175,000 votes, a margin, as testified by the Guinness Book of Records, unsurpassed to this day. Troubled by the Congress Party government’s resolve to strip the princes of their few privileges guaranteed by the Indian constitution, Jai, who then led the prince’s cause, was increasingly tired and unwell. In 1970 in mid-chukka at England’s Cirencester Polo Club, he suffered heart attack and died. He was 58 years old. In Jaipur more than half a million mourners lined the four-mile route of the funeral procession. Ayesha wrote, “Although Jai wouldn’t have wished me to retreat into stricken seclusion, that is precisely what I did.” She was disillusioned with politics. As prime minister, Indira Gandhi, daughter of Prime Minister Nehru, stripped the princes of their remaining privileges. In 1975 government tax inspectors raided her Jaipur home. For possession of 19 pounds and a few Swiss francs, she was arrested for violating Indian currency laws and, though never charged, was imprisoned four months, finally released on parole for a gall-bladder operation. The following year saw publication of A Princess Remembers, a best seller translated into several languages, and inspiration of a 1997 documentary, A Hindu Princess Remembers. Rich as was Ayesha’s life in experience and achievement as much as in material wealth, she paid dearly. Three of her four siblings pre-deceased her, as did her son and only child, as an adult, long after two earlier miscarriages. The polo world offered solace of a sort following the death of her beloved husband. Attending major tournaments the world over, conspicuous in brightly-hued saris, she presented trophies to winning teams, Indian polo’s last link with its golden age.